I moved to Leicester 18 months ago to be with Jim while he studied for his Phd for 3 years. Some people thought I was a little bit crazy - I didn't have a job to move to and had only been to Leicester for short family visits, but in my mind not moving wasn't an option. A couple of months after I moved I was due to be volunteering with a local arts organisation, so got out of bed extra early to fit in a Couch to 5K run, only to return home to a text message saying they didn't need me. 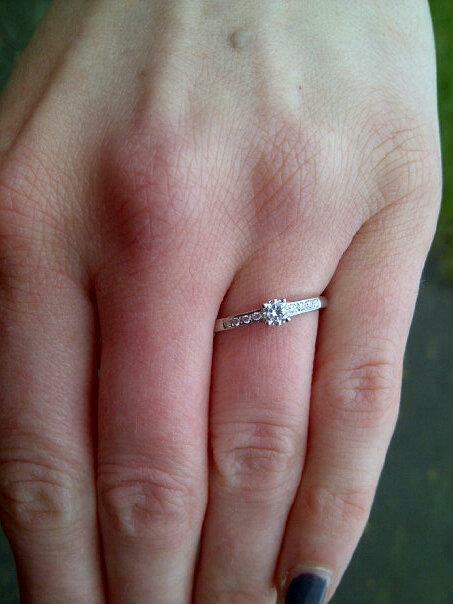 On the way in and half in jest, I tried to drag him to a jeweller shop window to look at engagement rings. Jim quite firmly told me to wise up and continued walking. I felt pretty embarassed and internally vowed not to mention it again. We picked some cards, wrote and posted them then Jim said he had to drop bike lights back to his friend Neil. I said I would go with him, but he reminded me that on his bike he could nip out and be back at our house quicker if he went alone. I felt very strange, like he was not being completely truthful, and I didn't want to go home without him, so suggested I'd grab a coffee, have a browse in Topshop and he could meet me back in town. A while later he returned, 'bike lights delivered' and we headed home. 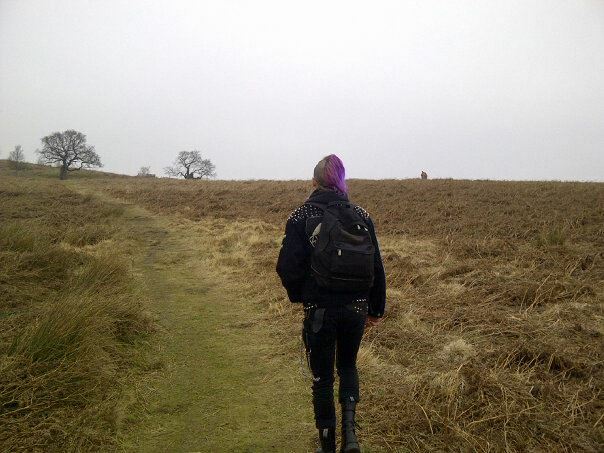 We still had most of the day ahead of us so Jim suggested a trip to Bradgate Park. Bradgate Park is gorgeous but it was a pretty grey day, I'd been for a run already and I just fancied snuggling up on the sofa with a book and some tea but was persuaded when Jim promised me juice and flapjacks and that he'd let me take some pictures of him where he wasn't pulling a face. So off we went. I managed not to get lost on the drive there, we parked and began our climb to a stone memorial at the top of the hill. 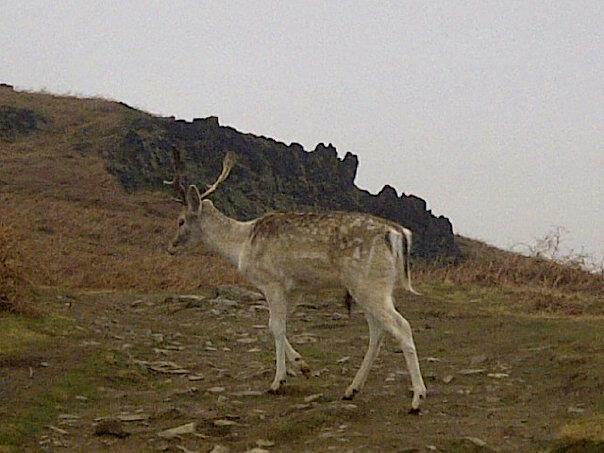 We got to see some deer really close up and sang a bit of Wuthering Heights by Kate Bush as we tramped up the moors. When we reached the top Jim unpacked our juice and flapjacks and I sat admiring the view. I'd found a folder of saved text messages on my phone the day previous. They were lovely messages Jim had sent me when he had moved to Leicester and I was back in Northern Ireland considering the move. I told Jim, and he asked me read them to him. Unfortunately that phone, a relatively unreliable Blackberry is now defunct, but the general tone of, and meaning in the messages were exactly what made my move to England so easy, secure in the knowledge that I was moving to be with the person who loved me most in the world. Jim suggested he take a picture of me on the memorial. If I'd had any clue I was getting engaged that day I would have selected my outfit a bit more carefully and probably considered applying some make up before we left the house!! It was the most beautiful ring I'd ever seen. I love it so much and looking back I'm glad Jim chose it for me as I couldn't have picked anything more perfect. As we drove home I tried not to be distracted by the new sparkles on my finger. Jim had cleverly already booked dinner in a restaurant that evening, so we got ready to head out. For the first couple of hours, as we walked around the house on cloud nine with our exciting news still a secret, it was nice that the moment was just between us. Then the madness began. Over a glass of champagne (pink, of course) we called our parents and grandparents first to let them know, then contacted our best friends and other family, before putting our phones down and heading out for dinner. The whole day felt like a dream, I'm still not completely sure half the memories I have are correct! Over the next few days and weeks we received messages and cards from family and friends. We knew this was a special occasion for us, but just couldn't have imagined how many other people would be as excited as we were by our news. We'd been together 10 1/2 years at that stage and friends from all different times in our lives got in contact. 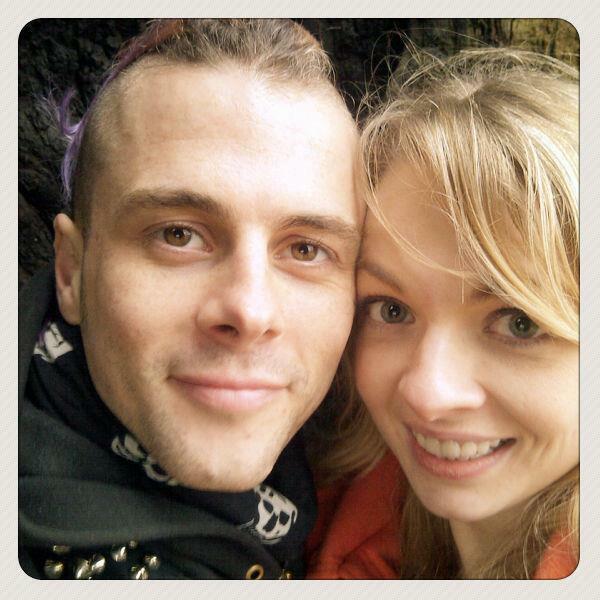 We are still so touched by how much our engagement meant to other people and how many people wanted to wish us well. I know we'd be together forever, with or without an engagement ring. Jim is really the best person I know and I'm well aware I'm the luckiest girl in the world getting to grow old with him at my side. You'll have loads of fun planning a wedding but trust me, get a wedding planner book! Awww I'm always walking up to that memorial! Now I will think of this story. So sweet. Look forward to congratulating you at the Leicester meetup! 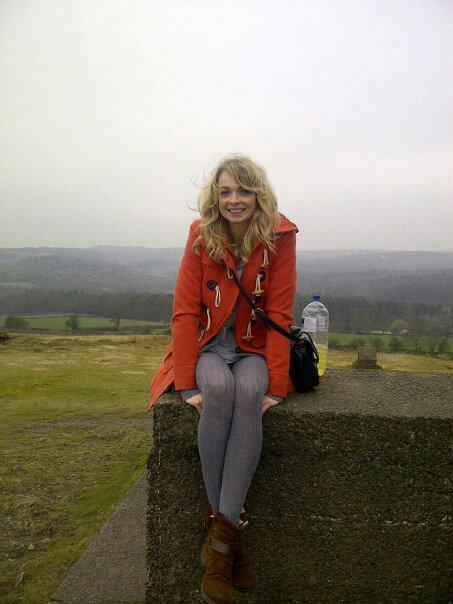 We haven't been back to Bradgate park in ages! Will be great to meet everyone at the end of the month!